The U.S. is in the midst of its third drug crisis in the last 50 years. Drugs are now the leading cause of death for prime working age Americans. In 2016, drug overdose deaths from opioids increased fivefold compared to 1999. Drugs are now more fatal than car accidents were at their peak in 1972, than guns were at their peak in 1993, and AIDS was at its peak in 1995. Drug overdoses also killed more people in 2016 than the total number of U.S. soldiers who died during the entire Vietnam War. The culprit is the opioid crisis; two-thirds of drug overdose deaths in 2016 involved a prescription or illicit opioid. The economic and societal implications of the drug crisis are broad and deep. In 2015, the U.S. spent 2.8% of its GDP on the opioid crisis according to The White House Council of Economic Advisers (CEA). Drug crises generate excess medical, substance abuse treatment, and drug prevention costs. Opioid abuse puts pressure on the criminal justice system due to increased policing efforts, associated legal efforts, and correctional facility costs. The Social Security Administration (SSA) doesn’t grant disability for drug addiction, but misuse of pain medication can lengthen disability claims. These are direct costs, but the indirect costs shouldn’t be overlooked. Some are easy to estimate, such as caregiver Family and Medical Leave Act (FMLA) requests and paid time off. Others are harder to estimate. How can we begin to quantify the impact of the suffering associated with fatalities and addiction? Why aren’t more people talking about the impact of the current drug crisis on the workforce and productivity in general? A few studies exist. A 2011 U.S. Department of Justice study explored the impact drug use has on the labor force participation rate and productivity. Another study found that nearly half of prime working age men not in the labor force are taking daily doses of prescription pain medications. The rate of opioid prescriptions and labor participation are intertwined. Areas with higher prescription opioid rates have lower labor force participation rates. For some injured workers, a prescription can be a gateway to substance abuse and their eventual exit from the workforce. For others, who may have already left the labor force, abusing a prescription opioid helps numb the emotional pain of the deteriorating economic conditions of their community. In addition to the potential risks of losing an abled worker, drug addiction leads to medically-related absenteeism, disability costs for the users, and caregiver-related absenteeism that adds to productivity loss for companies. In fact, a 2014 study published by the Workers’ Compensation Research Institute (WCRI) found that on average three-quarters of injured workers receive prescription opioids for pain relief after a workplace injury, but few receive services to help them navigate chronic opioid management. These factors are costly to families and individual companies, and they should be studied at an industry level. Unchecked this drug crisis will erode the health of the U.S. economy. This is particularly troublesome as the U.S. economy’s recovery from the Great Recession has been slow and unspectacular. Two key components of the U.S. economy are the performance of U.S. multinationals and foreign multinationals operating in the U.S. Together they account for a significant portion of output, productivity, employment, and exports. The manufacturing sector contributes disproportionately to these key economic indicators, and the recent rallying cry for a manufacturing renaissance shows that many Americans want to see it remain a critical driver of the economy in the future. The importance of manufacturing to the U.S. economy is so crucial that many optimists are forecasting its return to global dominance. But, we shouldn’t be too quick to predict the sector’s return to its 1950s and 1960s glory. Optimists are ignoring the impact of the drug crisis on the manufacturing industry. It’s a classic example of inattentional blindness. The MAPI Foundation analyzed the intersection of the current drug crisis and manufacturing to understand the risk it poses to the sector’s long-term health. 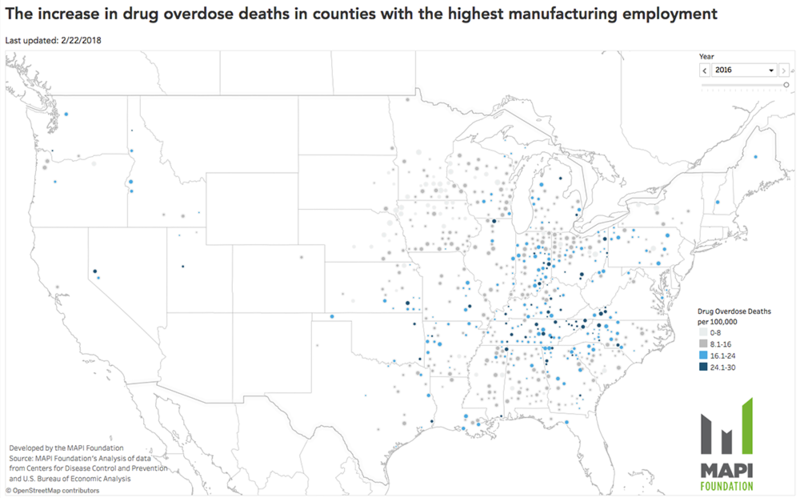 Our analysis compares manufacturing employment from the U.S. Bureau of Economic Analysis (BEA) and drug overdose deaths from the Centers for Disease Control and Prevention (CDC) to identify the U.S. counties with the highest share of manufacturing employment and most drug overdose deaths. Our findings illustrate the velocity with which the drug crisis has grown in manufacturing-centric counties, what it means for the industry today and in the future, and why manufacturers need to be vigilant and proactive. Conversations about the current drug crisis with manufacturing executives usually follow one of three paths – “I’m not worried,” “not a problem yet, but I’m monitoring the situation,” or “it’s really bad, can you help?”. The exasperation in the voice of an executive talking about how drug use is complicating hiring or how prescription opioids can lead to functioning addicts in the workplace is palpable. Stories range from as many as 40% of new hires failing their pre-employment drug test to knowing about prescription abuse in the workforce (sometimes enabled by pill mill doctors). Some manufacturing companies have a feel for how much the drug crisis affects their operations, but few fully understand the scale of the problem or can quantify the impact. The executives who know that drugs are affecting their business operate in counties plagued by high drug overdose rates. In 2001, the intersection of drug overdose deaths and manufacturing was an annoyance but not a crisis. The drug crisis made only a small impact on counties with the highest share of manufacturing employment from 2001 to 2009. During this time, less than 1% of these counties also saw the highest rates of drug overdose deaths. The acceleration began in earnest in 2009. As the crisis festered from 2011-2016, an average of 44% more manufacturing-centric counties joined the list each year. By the end of 2016, 70 counties that rely the most on manufacturing employment, located in 20 states, were grappling with deadly addiction. Individual counties started to see big jumps in year-over-year overdose deaths in 2009, but many were isolated enough from each other to remain under the state-level radar until 2014. In 2016, 25 states saw statistically significant increases in drug overdose deaths. Eleven of these states are reflected in our analysis; including Illinois, Indiana, Kentucky, Michigan, North Carolina, Ohio, Oklahoma, Tennessee, Texas, Virginia, and West Virginia. In 2015, only 19 states saw statistically significant increases in drug overdose deaths. Each year that this number creeps up it illustrates that policy interventions have yet to stem the tide of this public health crisis. You can also see first-hand what the rapid increase in drug use, specifically opioids, have done to the city of Huntington in Cabell County, West Virginia in the Netflix documentary Heroin(e). Cabell County is “the overdose capital of the country” with ten times the national average of opioid overdoses. The annual costs of the drug crisis are on pace to bankrupt the county according to Huntington Fire Chief Jan Rader, a central character in the documentary. Manufacturing employment is still strong in Cabell County. Manufacturers employ nearly 10% of the workforce, despite a 10% reduction of manufacturing jobs since 2008. A recent search of jobs posted on employment search engines returned open positions with manufacturers in both Cabell County and adjacent counties. In 2016, the 11 states in our analysis with troubling increases in drug overdose deaths generated 41% of manufacturing GDP. Take Ohio as an example. The state had 687,400 manufacturing workers and generated $108 billion in total manufacturing output that year. Ohio’s total manufacturing output represents 4.9% of total U.S. manufacturing output. The state ranks third after California and Texas. Ohio is also home to four of the counties with the highest drug overdose deaths and the highest share of manufacturing employment where well-known manufacturers like General Mills and General Motors operate. We should not ignore the risk the drug crisis in Ohio poses to total manufacturing output. Other states have more manufacturing-centric counties in crisis than Ohio, but they generate far less manufacturing output. The crisis in Tennessee spans 19 manufacturing-centric counties representing 20% of its administrative divisions. But Tennessee contributes half the amount of manufacturing output to the U.S. total as Ohio. It may be tempting to dismiss 70 counties as a small number in crisis. Another 201 counties that have the highest share of manufacturing employment are seeing more than the national median of drug overdose deaths as well. Put another way, 40% of the country’s manufacturing-centric counties are experiencing the worst of the drug crisis. Based on the historical trends, it is safe to say that in the next few years, a number of these 201 counties will find themselves deeper in crisis. The acceleration and penetration of this crisis have followed a consistent path across the country, and each year it has gotten worse. There’s no evidence of it slowing down yet. The crack crisis of the 1980s was an inner-city scourge experienced largely by communities of color. A different demographic group experiences today's drug crisis and many have been quick to link the national outcry to racial disparities that stubbornly persist in our society. The typical drug user is now more often than not male, white, and in their working prime. The profile of the typical drug user and the typical manufacturing worker is eerily similar. In 2016, manufacturing was 71% male and 81% white, and drug overdose deaths were 67% male and 79% white. Returning to the Ohio example, an important state for manufacturing, drug overdose deaths were 68% male and 89% white. Much has been written about the “deaths of despair,” but drug overdose deaths have bifurcated into two age-related groups – those in their middle age and those in their 20s to 30s. Any loss of life is tragic, but the increasing trend of younger drug users dying from illicit opioids has an irreversible impact on local economies. The lost future productivity from the premature death of prime working age adults compounds year-over-year. In an industry where the workforce closely resembles the demographics of drug overdose deaths, the consequences are painful today, and the effects will persist into the future as well. A number of experts are predicting U.S. manufacturing’s return to its position as the global leader in the near future. This optimism should be tempered with realism about some of the on the ground challenges the industry is facing. Manufacturing’s workforce has been aging for some years. In 2016, the median age of the U.S. manufacturing worker was 44.5. It’s no secret that manufacturing has an employment branding problem. Many parents have discouraged their children from pursuing careers in manufacturing, and today’s college graduate is more interested in Silicon Valley than the Rust Belt. The Great Recession had a disastrous effect on many industries, and since 2009, manufacturers have been battling back from low share prices, falling commodity prices, low capacity utilization, and labor turnover. Enter the drug crisis. While drugs aren’t a uniquely American issue, the problem is acuter within the U.S. labor force than other top manufacturing countries. In 2014, the World Health Organization reported the U.S. drug-related death rate was 6.96 per 100,000. It was five times higher than Germany, sixteen times higher than Japan, nineteen times higher than China, and twenty-nine times higher than South Korea. It’s undeniable that drugs are more of a drag on the U.S. economy than they are in the other top manufacturing countries. Every country has its own economic and workforce challenges, but our analysis has found that in the U.S. the drug crisis is accelerating in communities with large manufacturing workforces. If this trend continues unchecked, it will have profound effects on manufacturing in the future. Even though the national prescription opioid rate has declined in recent years reflecting new policies curtailing prescriptions, county-level prescription rates vary drastically across the country. As a result, some counties suffer a risk of addiction and overdose death higher than the national average. What Should Manufacturing Executives Do? Each addict and overdose death is one less available adult in the labor market, but the undermining power of the drug crisis is that it also hits manufacturing’s existing workforce. Nearly one in 20 employees will misuse a prescription opioid in some way this year1, and this makes them susceptible to addiction. It often begins innocently enough with an injury – perhaps at work – or a necessary surgery and a prescription for pain medication. Misuse comes in many forms and at its worse leads to dependency. The over-prescription of pain medication makes uninformed patients particularly vulnerable to an accidental dependency. The legitimacy of a medical prescription not only lulls a patient into thinking they are safe following their doctor's orders, but it also makes removing impaired workers from the workplace a delicate process. Addressing any level of impairment in the workplace is critical to workplace safety and should be a priority. Acknowledge that this problem has already arrived at your door. Unlike past drug crises, the opioid crisis is partially caused by the over-prescription of a legitimate pain medication making all prescribed individuals susceptible to an unintentional dependency. Employees who work in counties with lower prescription rates are not immune. Ignoring the intersection of the drug crisis and manufacturing will not change the reality of the situation. You can self-assess the risk to your manufacturing footprint using our national drug overdose map. Raise awareness of the drug crisis with your employees. Many prescription opioid addictions are unintentional. Enhance your wellness program with educational programs to raise the awareness of the risks of prescription opioids and how to use pain medication safely. Learn the signs of opioid abuse. An employee taking the proper dose of a prescription opioid is not a problem, but those taking more than the recommended dosage will cycle between some level of impairment and withdrawal while at work. Human resource professionals and managers should all learn the signs to identify employees posing a risk to workplace safety to themselves and others. 1. This number is calculated based on the 2015 National Survey on Drug Use and Health estimate of U.S. adult drug use and misuse rates and adjusted to reflect the probable misuse rate within the full-time workforce in January 2018 from the Bureau of Labor Statistics.